I do not participate in Black Friday, but Cyber Monday is another thing. No crowds, no pushing, no shoving and no need to get out of your pajamas! 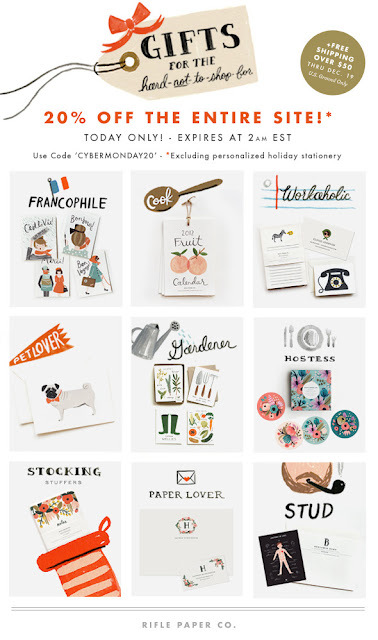 One of my all-time favorite paper companies, Rifle Paper Co., is taking part in Cyber Monday!!! You can save 20% off your entire purchase, plus free shipping if you spend over $50! I know a lot of you adore this company too, so be sure to stock up if you need anything! I have no affiliation with Rifle Paper Co., so this is not a sponsored post, just a lover of their products! Happy shopping and I can't wait to see what you all find online today!